Our goal is to promote sustainability to achieve our business objectives, environmental stewardship and social responsibility. We are fully committed to bringing high-quality, healthy and nutritious foods to people in a way that protects the environment, builds strong ties to our communities and enables our Group to grow and flourish. We believe that conducting business is not just for profit but also for the betterment of people and stewardship of our planet. Sustainability is one of the strategic pillars in our long-range plan as a testament to our commitment to sustain our future through our sustainability goals. Our Board of Directors ultimately oversees Del Monte’s sustainability strategy, which is developed together with our management team. The Board meets with management to review sustainability objectives and performance, which encompasses environmental, social and governance factors affecting the Group. Understanding stakeholders’ requirement for transparency, we strive to ensure that Del Monte adheres to the highest governance standards in doing business. For more information regarding our governance principles, please go to our website at www.delmontepacific.com/corporate-governance. Our sustainability strategy is developed by a cross-functional team composed of the leadership team and experts in different functional areas. Each functional team implements and manages the programmes to address the key material priorities of the Group to achieve the sustainability goals. This brings to life our vision to nourish families, enrich lives, every day. 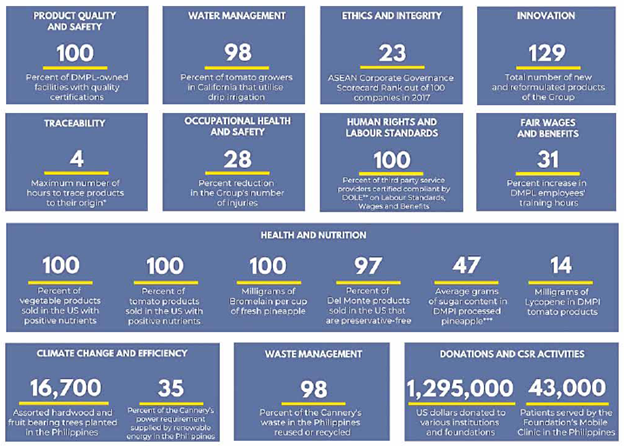 In the prior year, we completed an independent materiality assessment process to identify and assess our priorities with respect to products, people, the environment, governance, business and our stakeholders. We engaged the services of an independent global consultant, a sustainability specialist firm, to ensure the independent process of assessment. 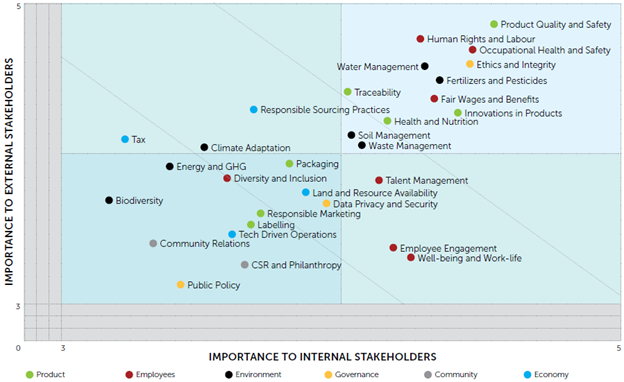 Identify the sustainability priorities, drawing on our knowledge of our Group and external sources to compile a list of issues specific to the food industry. 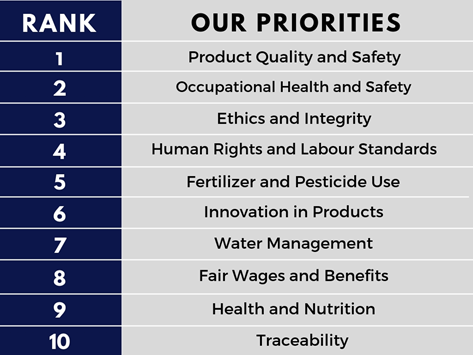 Based on the list of issues, we categorised 30 environmental, social and governance priorities to frame our discussion with internal and external stakeholders. Conduct a survey with internal stakeholders, i.e. employees, regarding the business impact of sustainability issues, which includes the scope and breadth of the issue, possible risk and magnitude of its impact, current regulatory and statutory regulations, and concerns from consumers, customers, communities and the government. Send a similar survey to key external stakeholders to determine the issues they are concerned with, which they would like the Group to address. The external stakeholders include customers, government and community organisations, industry and trade associations, certification bodies, non-government organisations, business partners, suppliers, academe, lending institutions and investors. Map the issues for the Group to prioritise and address the most important issues. Aside from these priorities, we also included in our report some emerging issues – soil management, talent management and data protection, privacy and cyber. The Group provided a section on climate change adaptation, plant breeding, and philanthropy as these are essential to our operations. We follow best practices and international guidelines in reporting our sustainability performance. The Group uses the Global Reporting Initiative (GRI) Sustainability Reporting guidelines. The Group has integrated the sustainability strategies and embedded them in the organisation. Our Quality Policy, Code of Conduct, Code of Business Ethics and Sustainability and Environmental Policies enable us to comply with the standards set by the GRI. This is closely monitored and reported, as illustrated throughout this report. The Group’s companies are members of several sustainability-related organisations. 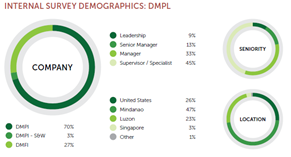 Some of the affiliations of Del Monte in the United States include the Stewardship Index for Specialty Crops, the US Environmental Protection Agency’s Pesticide Environmental Stewardship Programme and the Canned Food Alliance Executive Committee. Del Monte in the USA and Philippines are members of the Supplier Ethical Data Exchange. We continue to focus on building the long-term resiliency of our business as we deepen our understanding of the global business environment and remain mindful of the impact of our activities on the future of our planet. We are guided by our vision, values and goals to provide health and wellness, environmental stewardship and employee welfare. Fully acknowledging our responsibility towards the future, the Corporate Sustainability team leads our efforts to increase sustainability advocacy amongst our stakeholders. Key leaders across the organisation have been oriented on sustainable business and sustainability reporting. Each team within the Group has set goals to formalise commitments to our overall effort and recognise individual share of accountability as we strive to meet varying market demands. Each business unit has identified its material sustainability issues by location which may differ from the Group’s material issues given the business model employed by the business units. As an example, our company in the Philippines does the cultivation, planting and harvesting of pineapples, while our US subsidiary uses contract growers to source its fruits, tomatoes and vegetables. The sustainability report period is from May 2017 to April 2018, or FY2018, in line with our financial year. We have excluded our Indian joint venture business from this report since its contribution to the total business is not material. In the US, two locations closed in FY2018 and these have been removed from the US data.